Harlan Krepcik is a 2018 recipient of the John & Suanne Roueche Excellence Award, presented by the League for Innovation in the Community College. 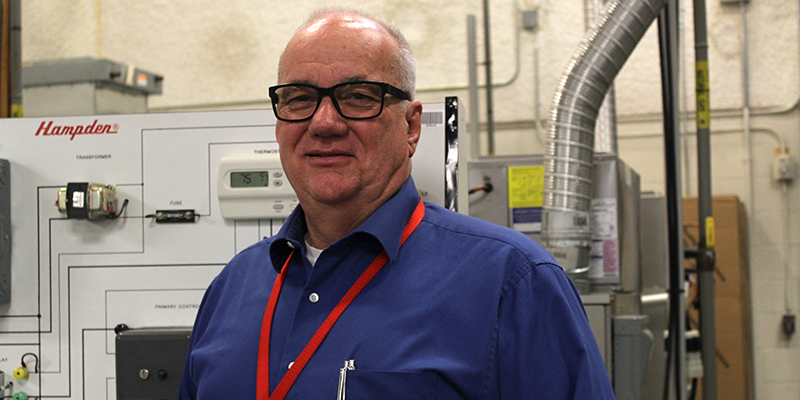 Harlan Krepcik began teaching at TCC in 1989 and has been program head of HVAC/R since 2012. A motorcycle trip 40 years ago from his native Nebraska to Norfolk set Harlan Krepcik on the path for success, even if he didn’t realize it at the time. The Tidewater Community College program head for Heating, Ventilation, Air Conditioning, Cooling and Refrigeration (HVAC/R) has been recognized for his outstanding contributions to teaching, leadership and learning by the League for Innovation in the Community College. Krepcik is a 2018 recipient of the John & Suanne Roueche Excellence Award, presented by the consortium of more than 750 community colleges and universities worldwide this week at the group’s national conference held at National Harbor, Md. When Krepcik biked to Norfolk with his father back in 1978 to visit two uncles, he was inspired by the history of the region so much that he started vacationing here before finally moving to the area with his wife, Karen, and children in 1986. His introduction to the HVAC/R field wasn’t so smooth. To improve his career options, he knew education was key, and he trekked some 80 miles away to attend school at night. But the crux of his learning came from factory training at companies where Krepcik went on to work – Trane, Lennox and Carrier among them. He loves to dispel myths about one of the coolest career paths around. The HVAC/R industry doesn’t have to mean a service technician crawling around insulation or outside of a house with a voltmeter on a 90-degree afternoon. Krepcik stresses it’s a versatile, dynamic field that extends beyond the thermostat in your hallway. “Over 50 percent of the HVAC/R energy consumed in the United States goes to HVAC/R equipment,” he said. The field is about controlling air quality, humidity and temperature indoors, whether it’s for comfort, for preserving food or ensuring proper climate controls in hospitals and manufacturing plants. Krepcik embraces problem-solving, the stuff that’s not in the textbook. He delights in a recollection of, while working for Trane, finding a solution to cooling 1,500 pounds of peanut butter from 195 degrees to 100 degrees before it was put on a semi-truck headed to the Hershey plant. “There’s always something different, always a new challenge every day,” he said. Krepcik, who has held multiple leadership positions with the Refrigeration Service Engineers Society, began teaching at TCC in 1989 and took over as program head in 2012. Two years after that, the college introduced an Associate of Applied Science in HVAC/R that allows students to specialize in one of five areas: residential, commercial, weatherization, energy management and supervision and management. The author of seven books in the field, Krepcik is meticulous about keeping the content in the program current. He is in constant touch with the leading manufacturers who have given him access to their websites, and he remains conscious of describing the science behind the subject. Krepcik, a TCC alum with two associate degrees, including one in business administration, holds a master’s in business with a specialization in project management from the New York Institute of Technology. Krepcik is also proud that an internship under a master mechanic is now part of the associate degree program. He works with the top companies in Hampton Roads to ensure students receive mentoring as interns. Last year Trane hired four TCC graduates who were former interns. Krepcik is the fourth TCC professor to earn the John & Suanne Roueche Excellence Award. The prior winners from 2012, the inaugural year of the award, are Peter Shaw, (business) Don Averso (culinary arts) and Gordan Whitman (psychology).